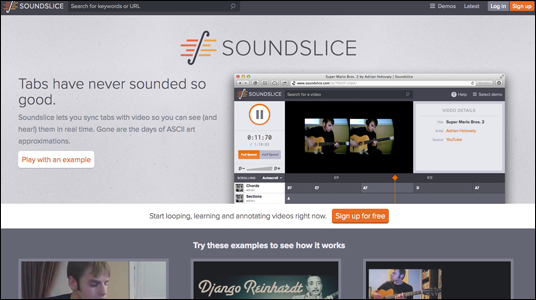 Soundslice.com takes guitar tabs to an entirely new level. These tab sheets take the task of studying guitar and change it into a super charged Guitar Hero. Learn to play new songs with a real time play through. Video instruction, as well as electronic tab sheets, show you in real time what each hand needs to be doing. Give these electronic tabs a try! >> Here are more guitar tab sites! This entry was posted on Monday, November 26th, 2012 at 4:02 amand is filed under . You can follow any responses to this entry through the RSS 2.0 feed. You can leave a response, or trackback from your own site.